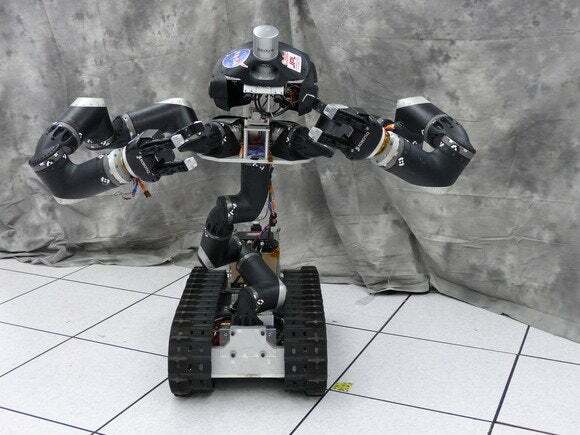 NASA is showing off a robot that brings a yogi’s flexibility to the delicate task of working in crippled nuclear power plants such as Japan’s Fukushima Daiichi, knocked out by a massive tsunami and earthquake in 2011. Nicknamed Surge (it’s officially known as Surrogate), the robot was designed by the space agency’s Jet Propulsion Laboratory to be able to manipulate valves and switches in areas that are too hazardous for human workers. Packbot robots, made by U.S. robot manufacturer iRobot, were deployed to Fukushima Daiichi to gather radiation readings from inside the complex, but Surrogate could bring a more hands-on approach. About 1.4 meters tall and tipping the scales at 90.7 kilograms, Surge consists of two arms, sensors and a spine mounted on tank-like tracks, which allow it to move over small debris but not climb up stairs or a ladder. At the end of its arms are three-finger Robotiq grippers to manipulate objects. Aside from two cameras providing stereo vision, it has a head-mounted Velodyne LiDAR (Light Detection and Ranging) that creates 3D maps of its environment. The machine is the successor to RoboSimian, a more ape-like robot that moves around on four limbs. RoboSimian is being prepared to face off against other droids in the DARPA Robotics Challenge Finals, a robotics competition sponsored by the U.S. Defense Advanced Research Projects Agency. The event is slated for June 2015. “Surrogate is better suited to tasks that involve a lot of manipulation, such as handling items like containers and bottles, as well as human tools and instruments,” Brett Kennedy, principal investigator for the RoboSimian and Surrogate robots, said via email. While Surrogate uses the same hardware as the limbs in RoboSimian, its distinguishing feature is its articulated spine. First declared operational in March, Surge has undergone tests at the Army Research Laboratory. It could be ready for field use in a year or two but its deployment will depend on which agency first adopts it, according to Kennedy.